I love fresh flowers all year round. In fact, having flowers in your home is proven to make you happy. 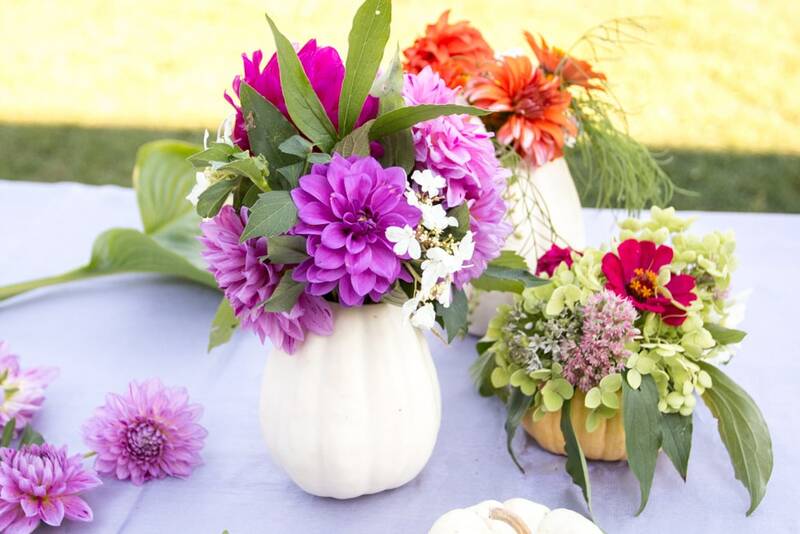 So when it’s Autumn, I am thrilled to be able to combine fresh pumpkins and my love for colorful flowers. 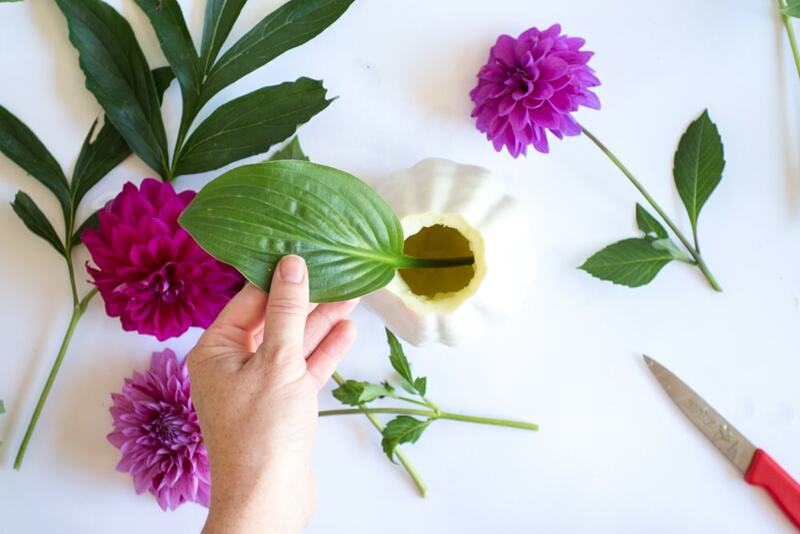 This White Pumpkin Flower Vase tutorial will show you how I absolutely love having flowers in my home for Fall. What I love about these fresh pumpkin flower vases is that they are so easy to make. 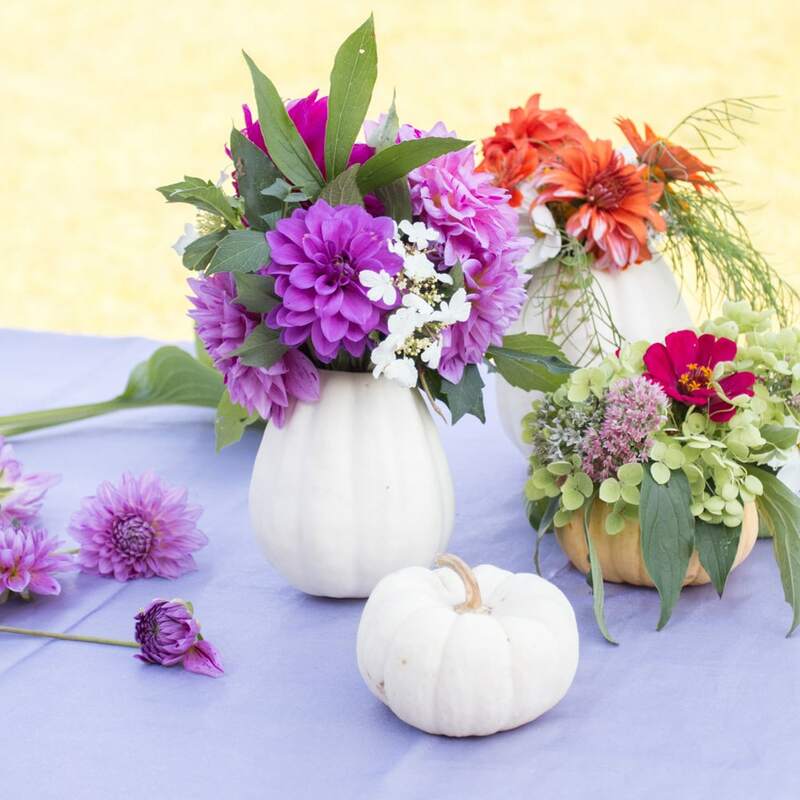 You can customize the pumpkin flower vases to your decor and what you have on hand. As you can see, we also show a mini pumpkin flower vase with an orange pumpkin. Or you could try gourds in different shapes. 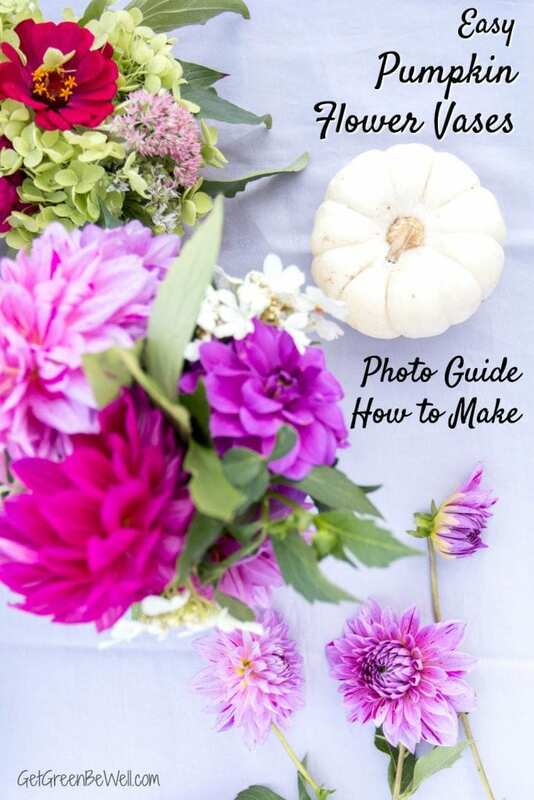 I love doing a fresh pumpkin flower vase using the large pumpkins that are sold for front porches. These big orange pumpkin flower vases are perfect for a dramatic and festive statement on your dining room table. Or in an entry way. If you’re weather is nice outside, consider putting a fresh pumpkin flower vase on your porch to welcome guests. First, wash the surface of the pumpkin. Use soapy water and gently get off any dirt or debris with your hands or a soft brush. Pat dry with a towel. If the pumpkin wobbles while it is placed on a table, you will want to level it. Slice a small bit off the bottom of whatever side is not level (be sure not to cut too deep!) so that it sits flat on a surface. 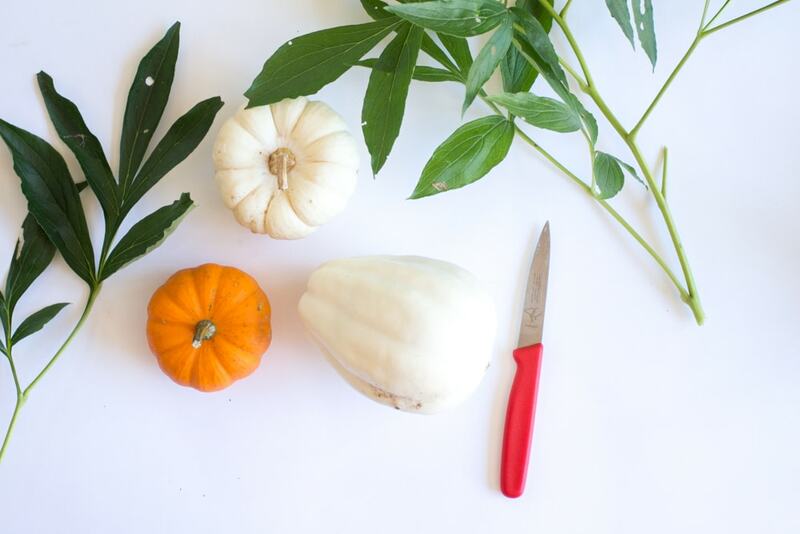 Carefully carve out a small, round opening at the top of the pumpkin using a sharp knife. The hole can be as small or as large as you’d like. 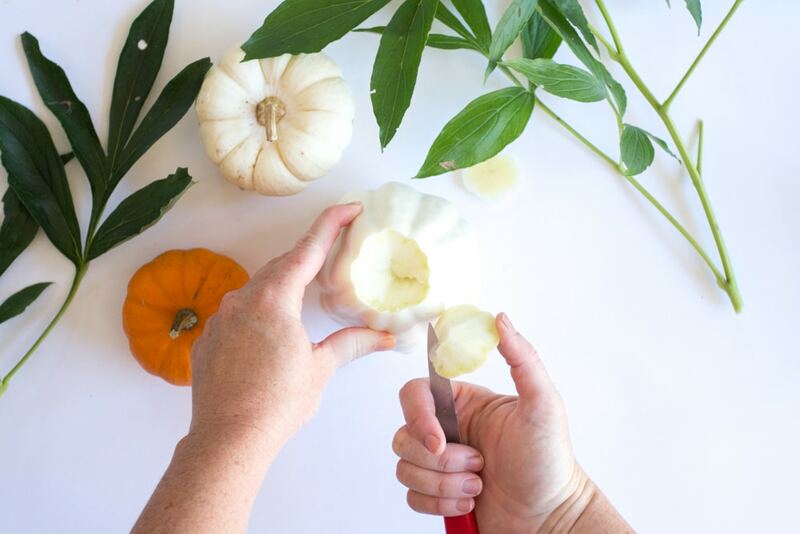 Always aim the sharp side of the knife away from you as you cut into the pumpkin top. 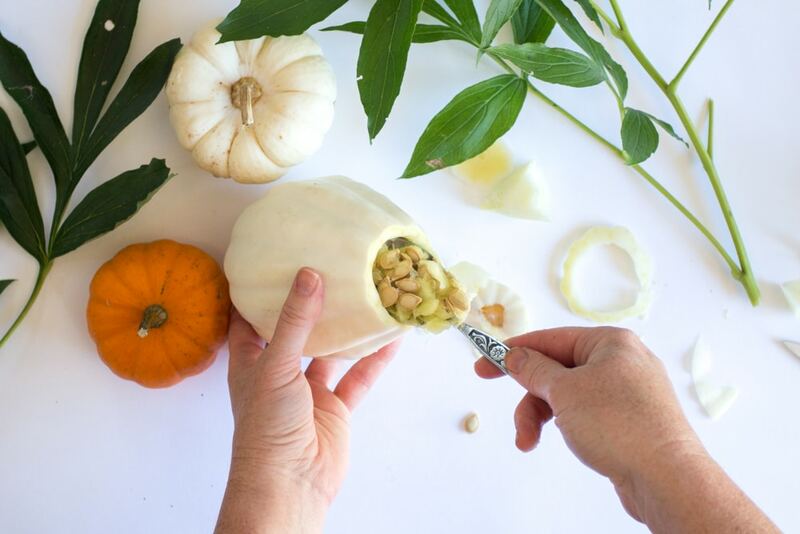 Scoop out the pumpkin flesh and seeds from the inside. Spoon as much liquid, flesh and debris out as possible. Rinse out the inside with running water to remove as much as possible. Next, fill the pumpkin about halfway with water. Add in greenery if you’d like to use any. Think of tree branches, shrubbery, pine needles and more evergreen plants. Now add your flowers. Add the tallest flowers in the center. 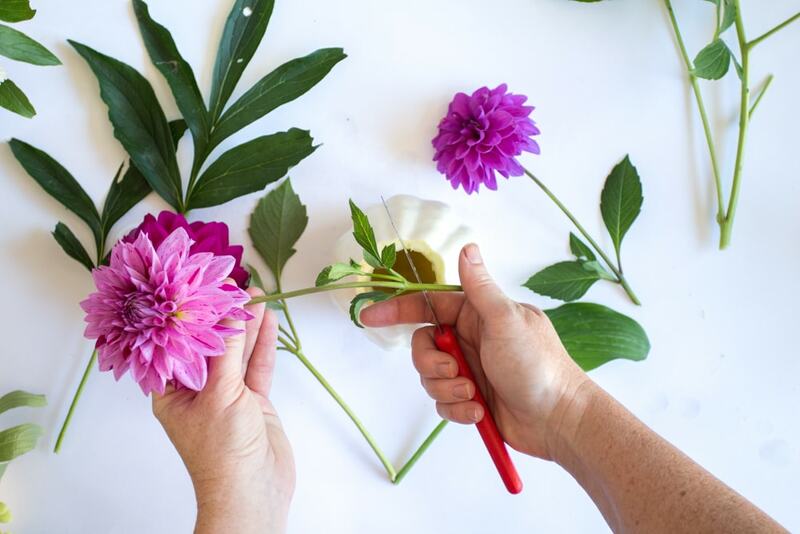 Then fill in the outside of the flower arrangement with shorter ones. Add as many flowers and greenery as you’d like until the flower arrangement if as full as you want. Keep this in Mind: Once the pumpkins have been scooped out, the pumpkin flower vases will last about 2 weeks. This will depend on your climate (For instance, in Florida, I couldn’t display these pumpkin flower vases outside for more than a few days before they would shrivel and get moldy from the heat. That’s why it’s so funny to see real Flamingos and Pumpkins together, like this!). 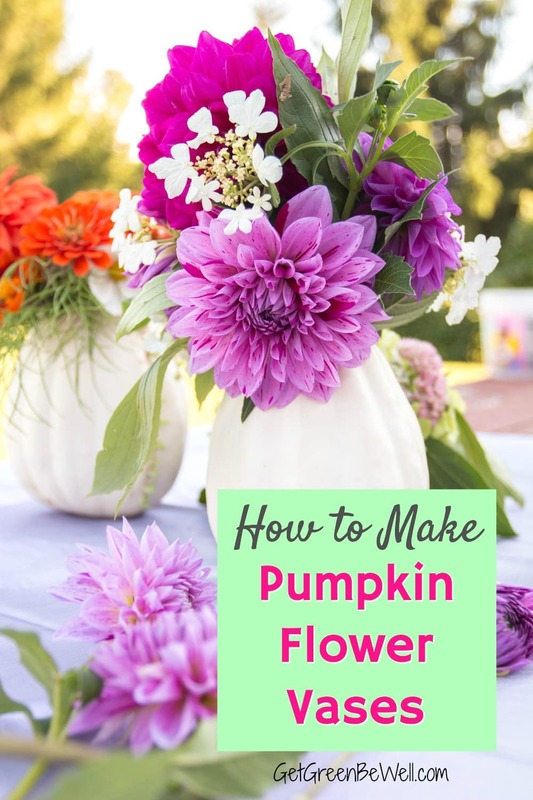 You will still need to add fresh water for the flowers as long as you keep your pumpkin flower vases full of fresh flowers. Another Idea: Don’t have fresh flowers? I’ve used this trick with real-looking fake flowers! You don’t have to remember to water the flowers. But you’ll still have a unique pumpkin flower vase for Halloween and Thanksgiving. 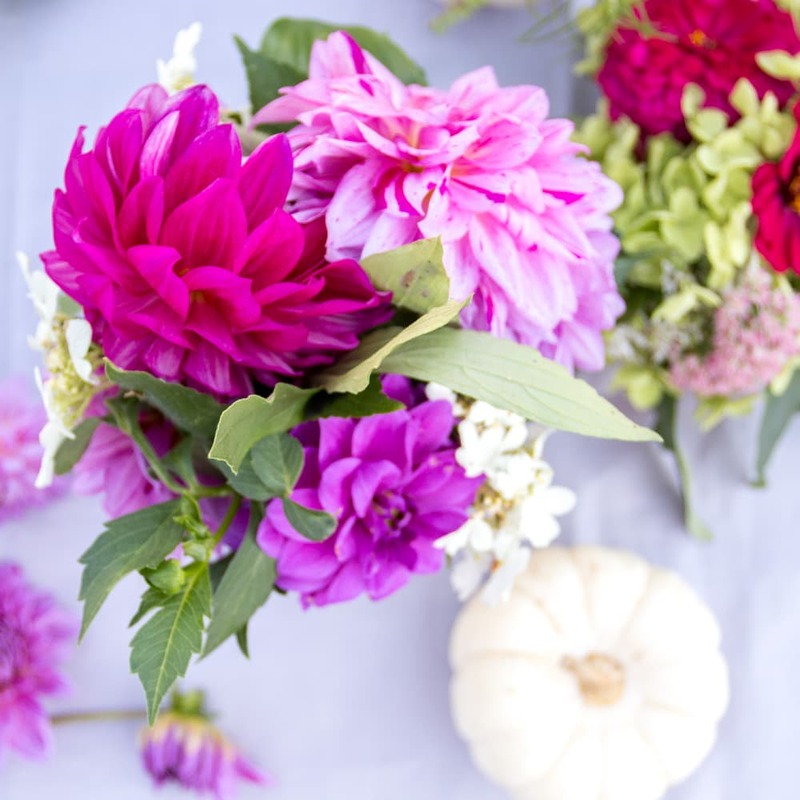 And if you need fresh flowers delivered right from the farm to your door, here our my favorite flower delivery websites.